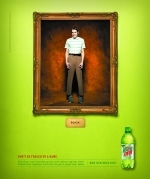 Mountain Dew has launched a new campaign created by BBDO New York for its Diet Mountain Dew. The campaign, which breaks this weekend during NASCAR and in March issues of Sports Illustrated and FHM, consists of a television spot and four prints ads shot by Sasha Waldman which carry the headline, "Don't Be Fooled By A Name" and the tagline, "How Dew Does Diet." The television spot explores whether Diet Mountain Dew is as much of a thrill as regular Mountain Dew and the print ads, as the headline indicates, encourage people not to get hung up on the term "diet." The print ads bring the message home clearly. The TV spot not so much. We had to watch it a few times before we realized the guy in the water with the shark was actually the guy drinking the Diet Dew. But that's just us. You can see all the print work here and the TV spot here. Advertising for Peanuts points us to an insightful commercial from HP which openly wonders where delted images go once they leave the camera. This commercial answers the question. View it here. Launching Sunday, a new spot from Staples will place the Easy Button in a not so office like situation. The 30-second "The Wall" commercial created by McCann Erickson, opens on an Emperor in ancient China, standing on a grassy rolling hill, staring off into the distance with a small group of consorts behind him. Galloping towards the Emperor is a large army of fierce warriors. As they approach, a consort pulls out an ornate lacquer box. One of the Emperor's men opens it and inside is an Easy Button. With the warriors dangerously close, the Emperor steps forward with his arms crossed and his has one of his warriors confidently pushes the Easy Button. "Many years ago, during the extremely awkward-yet-memorable Mentos campaign there was one spot in particular called "The Car Movers" wherein a young lady has her car boxed in by an executive meanie. She eats a Mentos, and four burly guys in overalls move her car for her. All is well. Just as many years ago, I wrote a facetious piece comparing that commercial with the Bolshevik revolution of 1917. Well, that young lady found the piece and just emailed me. She lives in South Africa, where the spot was shot, and she's never seen her cult classic commercial. She's spent THIRTEEN YEARS trying to find a copy, poor girl. Or woman now. I have made it my mission to find her that spot as she's almost like a celebrity to me, and I can also relate to trying to track down a copy of a TV spot, though not for 13 years. If you have any leads, I'd love you in the thankful way." Have a heart. Help a girl out. 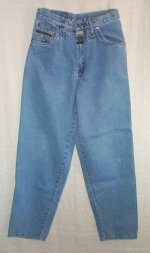 We have vague memories of those Bugle Boy Jeans ads where the women check out the guy's jeans rather than the guy and ask, "Are those Bugle Boy Jeans You're Wearing?" Apparently motivated by seeing someone wear these fashion faux paus, What Would J.Crew Do wrote three versions of a Bugle Boy ad as if they were to be on the air today. Funny stuff. Advertising For Peanuts points us to yet another creepy Burger King commercial in which the King convinces is to sample his meat in a not so G rated manner. Crispin, if they are behind this as this is a UK spot, has truly taken the Burger King brand to new heights though we wonder if these height aren't moving them into the Hooters category of restaurant chain.